I received a tweet from Carl Verheyen today about a new movie he will be in soon. The movie is titled: “Turn It Up!” and is a feature-length celebration of the electric guitar. 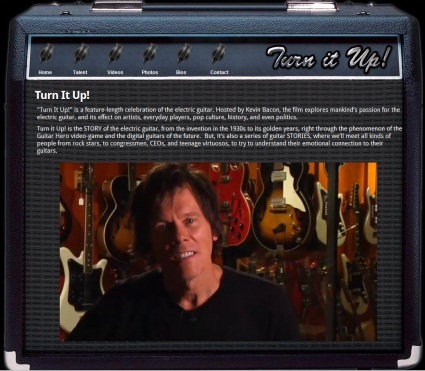 Hosted by Kevin Bacon, the film explores mankind’s passion for the electric guitar, and its effect on artists, everyday players, pop culture, history, and even politics. Turn it Up! is THE STORY of the electric guitar, from the invention in the 1930s to its golden years, right through the phenomenon of the Guitar Hero video-game and the digital guitars of the future. But, it’s also a series of GUITAR STORIES, where we’ll meet all kinds of people from rock stars, to congressmen, CEOs, and teenage virtuosos, to try to understand their emotional connection to their guitars. You MUST SEE the trailer for this film! Watch it by CLICKING HERE.